The kids don't start school for three more weeks. We have three more weeks of summer-ing to do and I couldn't be happier. I'm all about staying in our pajamas until lunch time, taking nature hikes in the middle of the day, going to the pool and playing cards on the front porch after breakfast. I don't miss the homework battles or the rush of life. 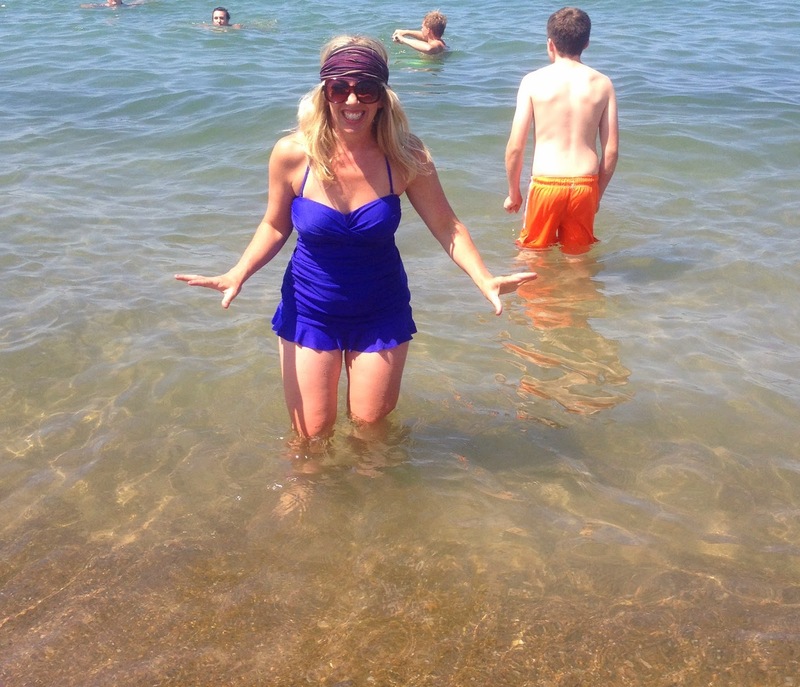 In the spirit of We Never Want Summer To End!, we went to the beach this past Saturday. 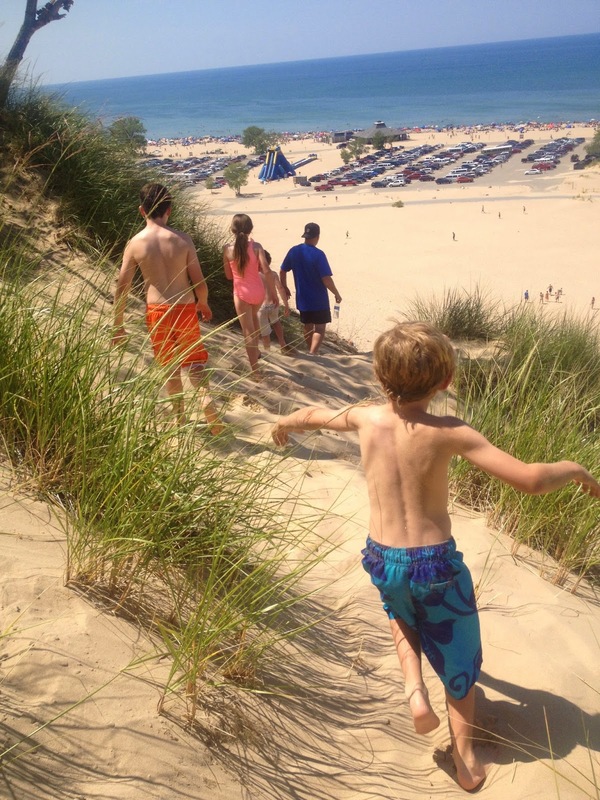 We went to Warren Dunes State Park in Southwestern Michigan. I used to go there all the time when I was a kid. 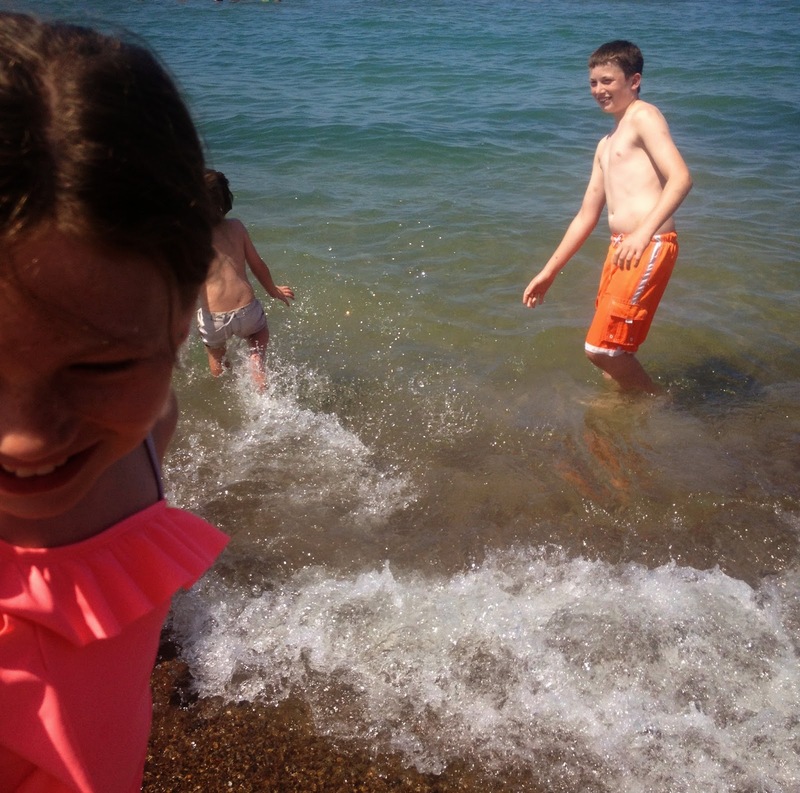 My brother and sister and I used to climb the dunes, dare each other to swim in the freezing cold waters of Lake Michigan and bury each other in the sand. We loved the yellow flag days when the water was a little rougher and there were actual waves that we could ride our flimsy rafts over. The beach hasn't really changed in the last 30 years. Sure there's some sand dune erosion and way more people use umbrellas to sit under and more parents slathering on sunscreen on their squirmy kids (30 years ago there wasn't an umbrella in sight and the only slathering that was going on was some sort of Get The Dark Tan You've Always Wanted oil). 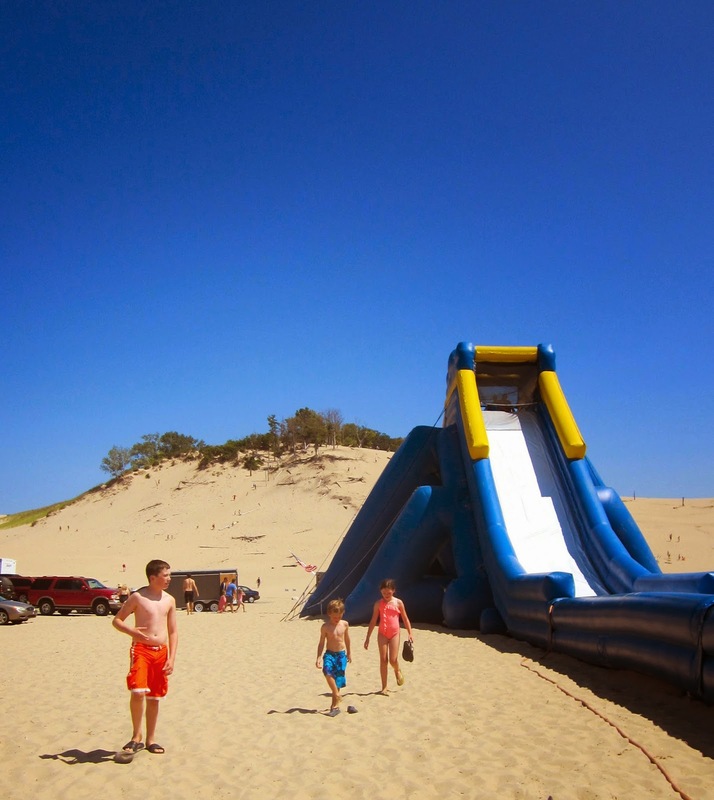 The slide is a righteous new addition. We all went down and we all loved it. *Even though it seems people are taking precautions with their skin, there were still a lot of people with cigarettes, there was even a pregnant woman smoking in a bikini just like it was 1980. Almost all of us enjoyed it the same too. 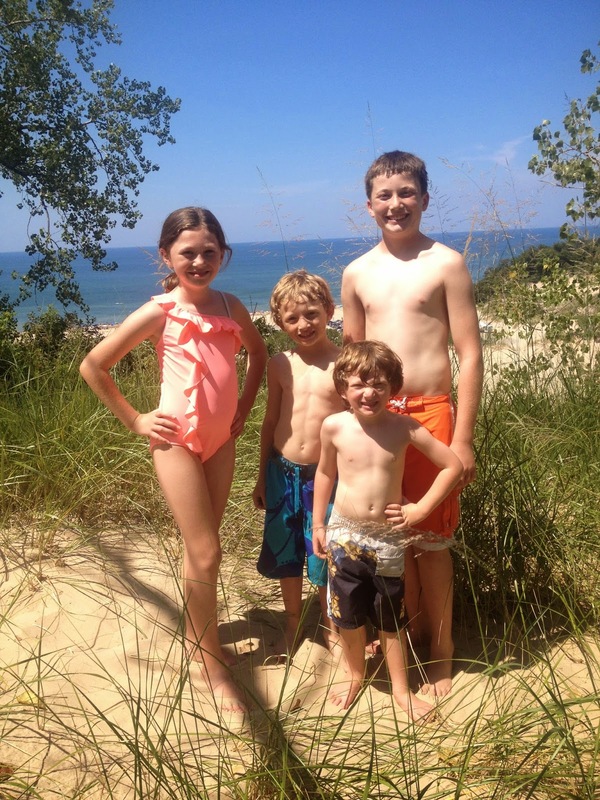 We climbed the dunes, dared each other to swim in the cold water and the kids buried each other in the sand. Who cares that his bathing suit is on backwards? Not Wade. 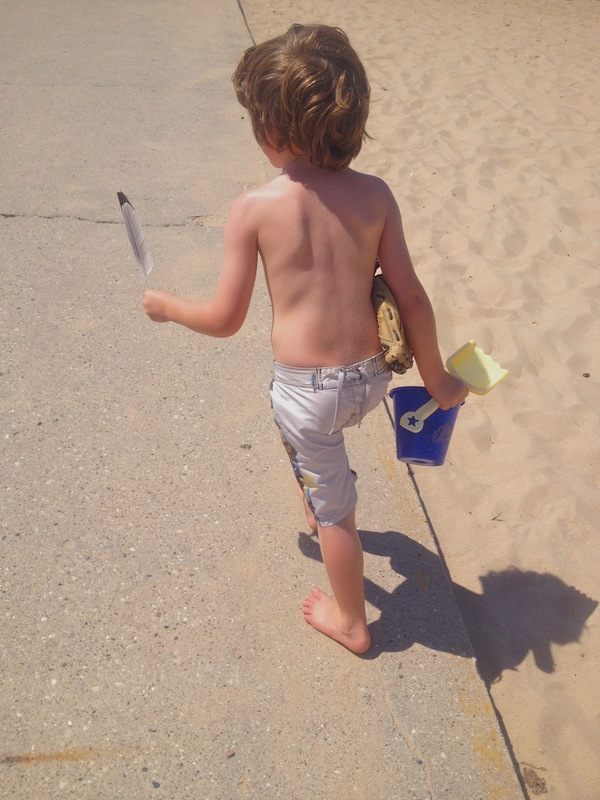 He's got his shovel and pail, baseball mitt and he found an "Eagle" feather. He's all like yo, bring it beach. Lake Michigan is very cold. What a cute little beach bum. I could stay at a beach for a long time, maybe forever. Get in the water, dry off, get back in, climb a dune, get ice cream, lay around, people watch, build a sandcastle, dip my toes in the water, walk on the shore, look for pretty rocks, climb the dune again, watch some more people, have a picnic and then as the sun sets think about going home. Tim is not really on the same page. He is a good sport and appreciates my love of all things summer-y and beach-y, but he doesn't share it. This past Saturday, he attacked each activity as if it was a goal to check off a list. He went to the top of the dune. Check. Dipped his toes in the water. Check. Then he looked at me and said "You about ready?" Which meant ready to go home! What?!!! We compromised because that's what you do in marriage, right? We stayed longer than he wanted and not as long as I wanted. We met in the middle and it worked out all kinds of right. We were all exactly on the same happy and satisfied page with the ice cream twist cones we got before we left. Summer isn't over yet and for that I am beyond grateful. I love this. Can I go with you next time? Yes! I'd love for you to come along. :) We love all the same music, we would have so much fun. You look so happy there! Even freezing in the lake. And I love the beach, especially if I only have to go in the freezing lake up to my knees and spend the rest of the time burrowing my feet in the sand.